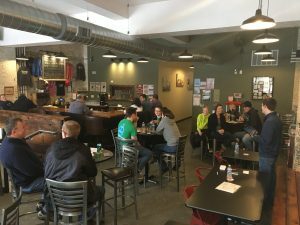 The Protect Wisconsin Waterways group hosted its first-ever trivia event on Saturday, January 26th at the Rock County Brewing Company in downtown Janesville. There were five teams competing in the Jeopardy-style trivia. The questions were water themed and with categories such as Miscellaneous, Geography, Around the Home, Entertainment, and Pop Culture, it was something anyone could participate in. Each team received prizes for participating. These prizes consisted of Protect Wisconsin Waterways swag like beer glasses, pencils, pens, wristbands, stress balls, and more. From handing out informational brochures, asking people to sign pledges, and having Protect Wisconsin Waterways and stormwater specific questions, we were able to spread awareness while engaging community members in a fun event. We received four pledges and engaged with a total of 30 people at this event.